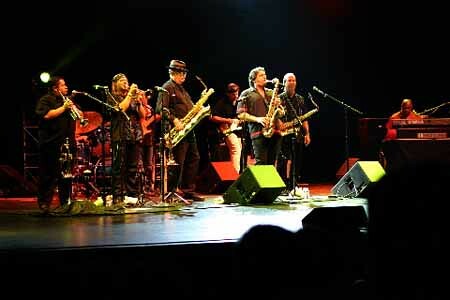 As always, Tower of Power was excellent. They did a few of their old songs that I had never heard them play live. Guitarist Bruce Conte, a member of the group some thirty years ago, has rejoined other originals Francis Rocco Prestia, David Garibaldi, Emilio Castillo, and Stephen "Doc" Kupka. It was good hearing vocalist Larry Braggs again (per Emilio "pound for pound the most soulful singer on the planet"), as well as Roger Smith on keys and Adolfo Acosta on trumpet. I was able to talk with Garibaldi, trumpeter Mike Bogart, Rocco, and tenor saxman Tom Politzer. Tom is a very funky player with unbelievable chops. His altissimo register is very good and I talked to him about it. He said that being a clarinet player improves his altissimo sax notes. I told him that clarinet had been my main instrument throught college too, but that my sax altissimo doesn't sound a thing like his! Rocco and David both signed photos of me with them from a previous concert and have been added to my Tower of Power wall in my studio. Sir Tom is an exciting entertainer and his band is truly outstanding. TOP alumni Herman Matthews is Jones' drummer. A full horn section featuring Kenny Anderson, a wonderful sax player, was phenomenal. Music director/guitarist Brian Monroney was exceptional. 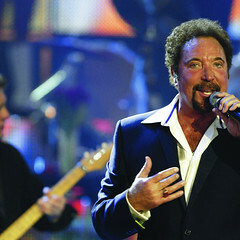 Sir Tom brought three delightful soulful backup singers that really added to the show. He sang all of his big hits including What's Up Pussycat, She's A Lady, It's Not Unusual, Green Green Grass of Home, Delilah, Help Yourself, I'll Never Fall In Love Again, Daughter of Darkness, and his current UK top ten hit Stoned in Love. He also covered Prince's Kiss and the Joe Cocker rocker You Can Leave Your Hat On. Womens apparel from excited fans flooded the stage all evening. I got a good laugh out of watching the women going nuts. I leaned over to Sharon, laughing, and asked "Can you believe these idiot women? Does he look that good?" Sharon looked at me in amazement and said "Just look at him...it's obvious!" I enjoyed his concert, but still don't understand his effect on the women. I'm going to study on it though! He's obviously doing something right. If I find the secret, I'll be sure to pass it on to the rest of the guys that read this blog.